Resembling the images taken by the Hubble Space telescope, forming a cloud inside of a structure (around 2,5m high, 3m long, 2m wide), around 200 little glass bottles (probably 50ml and 100ml) will be hanging. The bottles are filled in different amounts with different chemical elements and/or objects representing each element (for example matches representing Phosphorus). 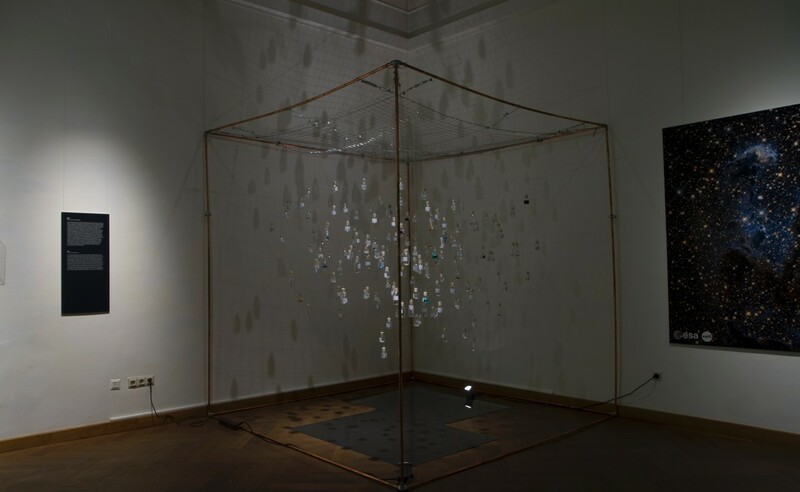 They hang like a constellation, and the viewer can identify through a “star map” different groups of bottles. One group of 11 bottles contains the chemical elements (or the objects in representation of these elements) that form the human body (Oxygen, Carbon, Hydrogen, Calcium, Sodium, Phosphorus, Chlorine, Magnesium and Sulfur), another group of three bottles contains the elements of the sun in our solar system (Hydrogen, Helium and a little bottle with the “rest”), another group of 11 bottles contains the elements forming Mars, another one the elements forming Saturn, and so on. There will not only be groups of bottles, but also bottles hanging by themselves with the elements that are found in the solar system, the milky way and up to the ones that have been found in the rest of the universe. The group of bottles all together resemble in the way they are hanging a picture that could be taken by the Hubble telescope, from far away the viewer should be able to imagine them floating in the structure, since they hang from thin strings. Every bottle will have a label with the name of the element that they contain. The cloud of bottles will make the chemical similarities between the cosmos and the human body visible, and make the viewer think to what point is he different to the stars if the chemical elements are the same. There should be a “star map” to help the viewer identify in which part of the cloud “human”, “mars”, “sun” etc. can be found. Maybe even a little map of the cloud with the phrase you are here pointing to the group of bottles that contain the “human elements”. The “star map” will be printed and put on one wall on the side of the cloud.